Learn the fundamentals of the college admissions and financial aid processes in ONE DAY. Want to help students succeed in school? Desire to create a college-going culture? Need to improve your school or district’s graduation rate? Seek to get students to and through college? Join the Expanding College Opportunity college admissions and financial aid processes training workshop and learn winning strategies to help students on their path to higher education. What will the Expanding College Opportunity training workshop provide? Who should participate in the Expanding College Opportunity training workshop? 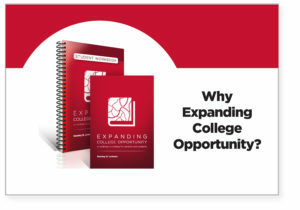 What are the benefits of the Expanding College Opportunity training workshop? Who leads the Expanding College Opportunity training workshop? Complete the client input form or call Stan at 404.869.1290. The time and location of our next public training workshop will be announced. If you are not able to attend an Expanding College Opportunity public workshop for which you are registered, you may substitute another person in your place at any time with no penalty. If you wish to cancel your registration 15 days or more before a public workshop, you will receive a complete refund, minus a $100 processing fee per cancelled ticket. Refunds are issued between between 30 to 60 days after the date we are notified in writing of the registrants desire to cancel his or her enrollment. No refunds will be issued to any registration cancelled 14 days or less before the event.